A Bittersweet Goodbye: White House Pastry Chef To Move On : The Salt Bill Yosses had to learn to make leaner, more healthful versions of his recipes when Michelle Obama moved in. He says those lessons have inspired his next venture in New York. 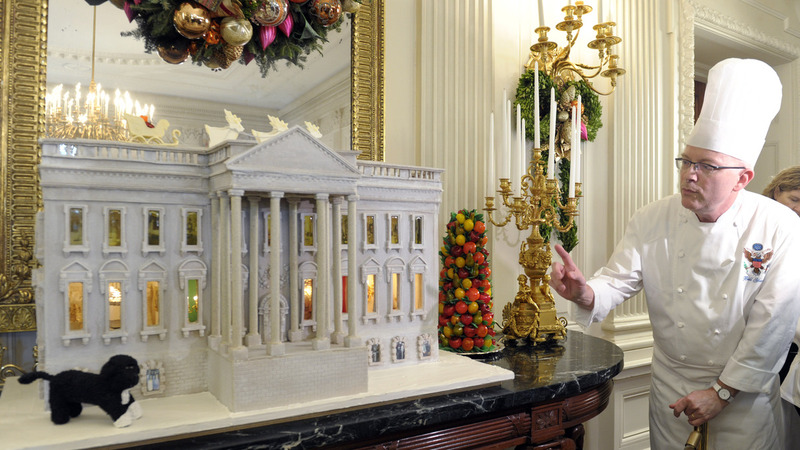 Among Bill Yosses' many confectionary creations for the first family: this nearly 300-pound gingerbread model of the White House, on display in the State Dining Room in November 2012. The house featured not just Bo, the family dog, but also a vegetable garden. The first family must be crust fallen. Bill Yosses, the White House pastry chef, is moving to New York in June. "Though I am incredibly sad to see Bill Yosses go, I am also so grateful to him for his outstanding work," first lady Michelle Obama said in a statement. She credited Yosses as "a key partner helping us get the White House Kitchen garden off the ground and building a healthier future for our next generation." The pastry chef, who joined the White House staff in 2007, told The New York Times he's been adjusting his own recipes to be leaner and more healthful. But he hasn't given up on traditional sweets. "I don't want to demonize cream, butter, sugar and eggs," Yosses told the Times — a quote that was taken completely out of context by the Daily Caller. In an article on Yosses' departure, the conservative media outlet suggested that the first lady's push for more healthful eating had driven Yosses out of the White House kitchen. But it turns out the "controversy" was as much a confection as one of Yosses' desserts. (Although not as sweet.) In fact, Yosses told the Times he wants to build on Mrs. Obama's efforts. His next project will involve teaching both children and adults how to eat better. It's a bittersweet decision," Yosses told the Times of his move. In New York, Yosses will join his husband, Charlie, whom he married in 2011.